Warrior Trading | A Simple Day Trading Strategy For Beginners: Gap and Go! Click here for the hottest stocks gapping up/down today! In our recorded webinar I discuss the Stock Trading Strategy that I use every single day. My focus each day is the same. Finding the big gappers, hunting for the catalyst, creating a watchlist, and executing my trades according to the strategy. This is the same thing everyday. Repetition is what makes us so good at these strategies. Discipline is what keeps us profitable. 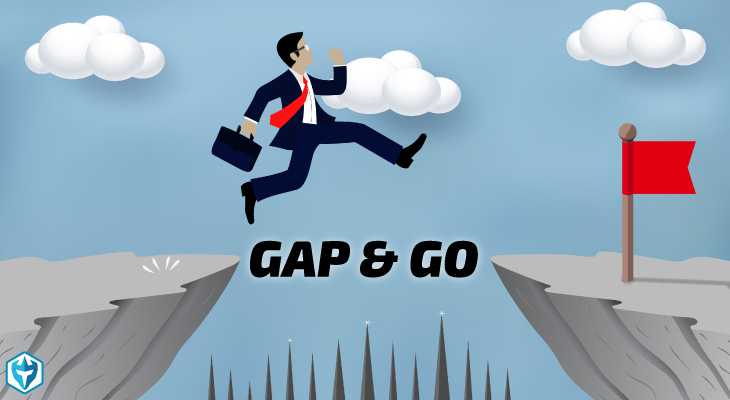 Learning a Strategy for Day Trading the “Gaps” or “Gappers” is critical for success in the market! I trade a Gap and Go! Stock Trading Strategy. Everyday I start the same way. 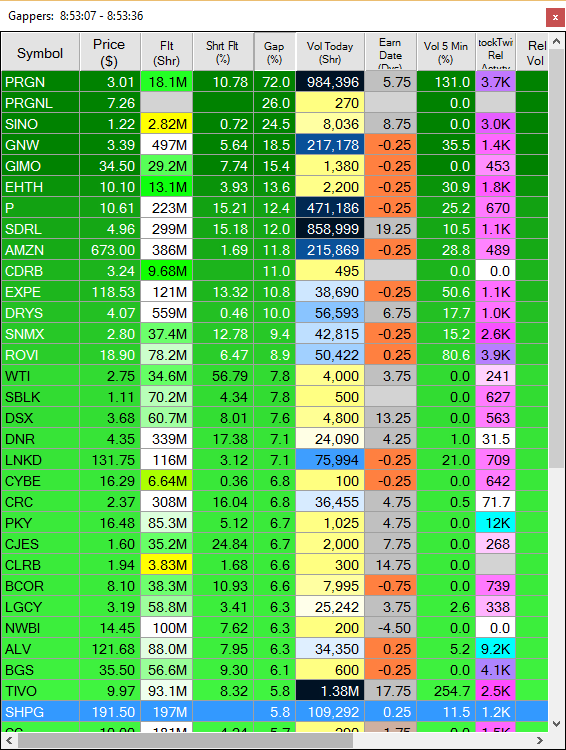 I look at the gappers that are more than 4% using my pre-market scanning tools from Trade-Ideas. Gaps of more than 4% are good for Gap and Go! trading, Gaps of less than 4% are usually going to be filled but I don’t find them as interesting. Once I have found the stocks already moving I search for a catalyst. I use StockTwits, Market Watch, and Benzinga to hunt for news. Only after confirming the catalyst I will begin to look for an entry. My Gap and Go! Strategy is very similar to my Momentum Day Trading Strategy. The difference is that the Gap and Go! Strategy is specifically for trades between 9:30-10am. I look for the quick and easy trades right as the market opens. Gap and Go! is a quick stock trading strategy to give us a profit usually by 10am. In our Day Trade Courses we will teach you the ins and outs of this strategy. 5) At 9:30am as soon as the bell rings I buy the high of the first 1min candle (1min opening range breakout) with a stop at the low of that candle or buy the Pre-Market highs. Entry Setups 4. 5. and 6. are for Trading Course Students Only. Always look for low float stocks. These will have home run potential written all over them. A stock that has a 10mil share float and trades 1mil share pre-market has already traded 10% of the float. There is an extremely good chance the entire float will be traded during the day once the market is open. These are the type of stocks that can run 50-100% in one day. When we have the right catalyst, float, and retail trader interest, it’s the perfect storm for a big runner. 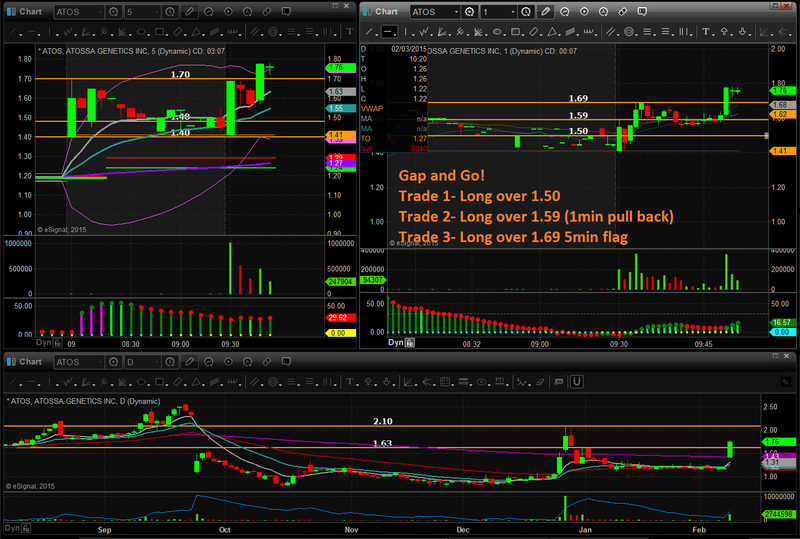 $OHGI Gap and Go Case Study – First we check the Gap Scanner for potential trade ideas. From the Watch List – NEWS OHGI: (14m) 2.16, watching long over 2.20. OHGI: One Horizon Group – The Company announced that its App is now supporting China’s mobile pay platforms including Alibaba’s Alipay, Tencent’s Wechat Wallet, and China Union Pay. Gapping up % with a 14.3M share float. 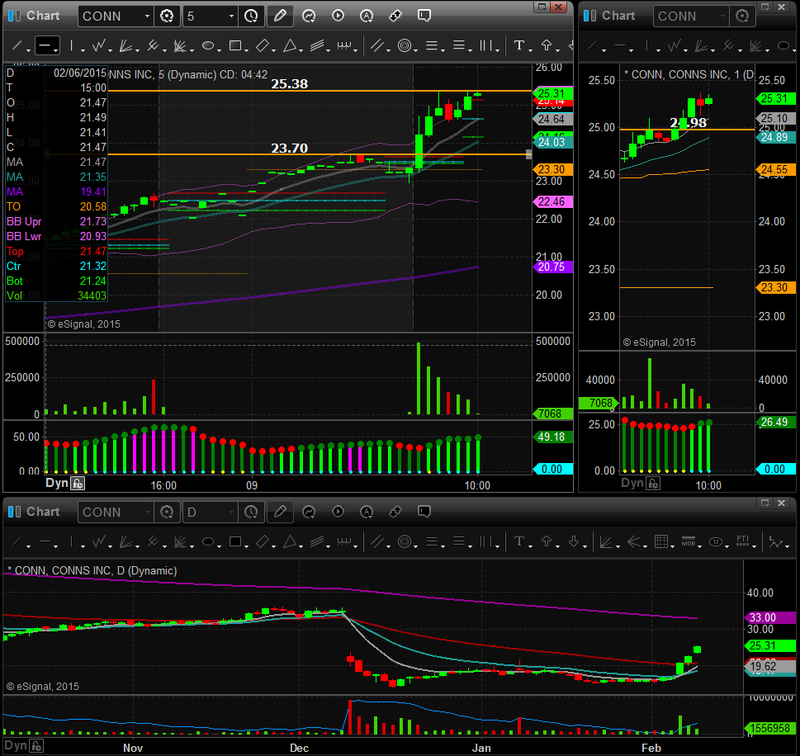 $TCCO Gap and Go, squeeze over pre-market highs. Entry at 4.75, ride the momentum. 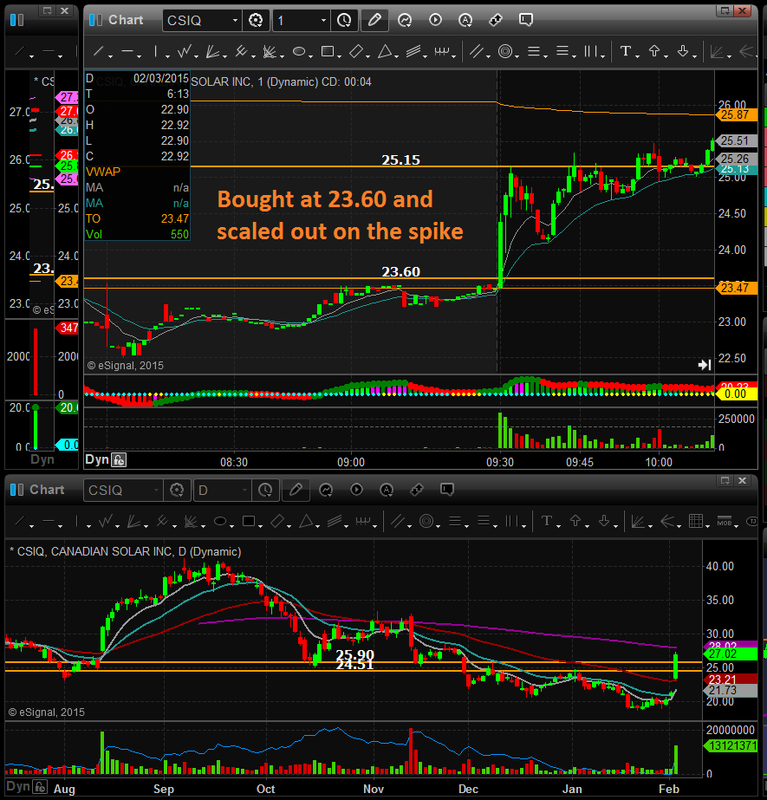 $CSIQ really nice gap with pre-market flag at 23.60, bought this at 23.60 and rode the wave up to 25.00, what a nice move. 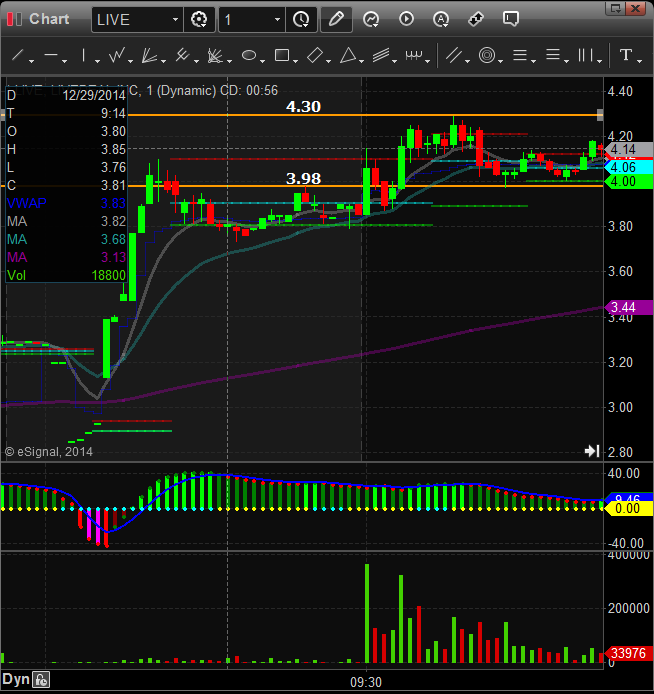 $MTSL beautiful Gapper with pre-market high of 1.94. 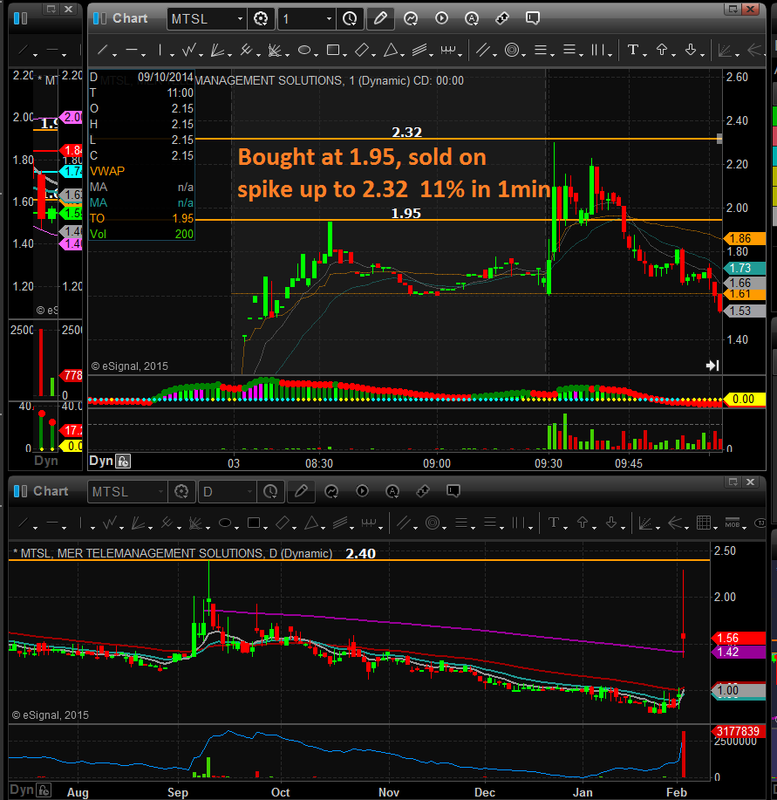 Bought the breakout and sold on the spike up through 2.30 for an 11% move in less than 1minute. Picture perfect! $NVGN nice gap pre-market with a low float stock, bought the pre-market flag at 2.70, then bought the first pull back at 3.00, skipped the 2nd pull back at 3.13 but that would have been a nice one too! $BCLI – big gap up in anticipation of news on Monday. 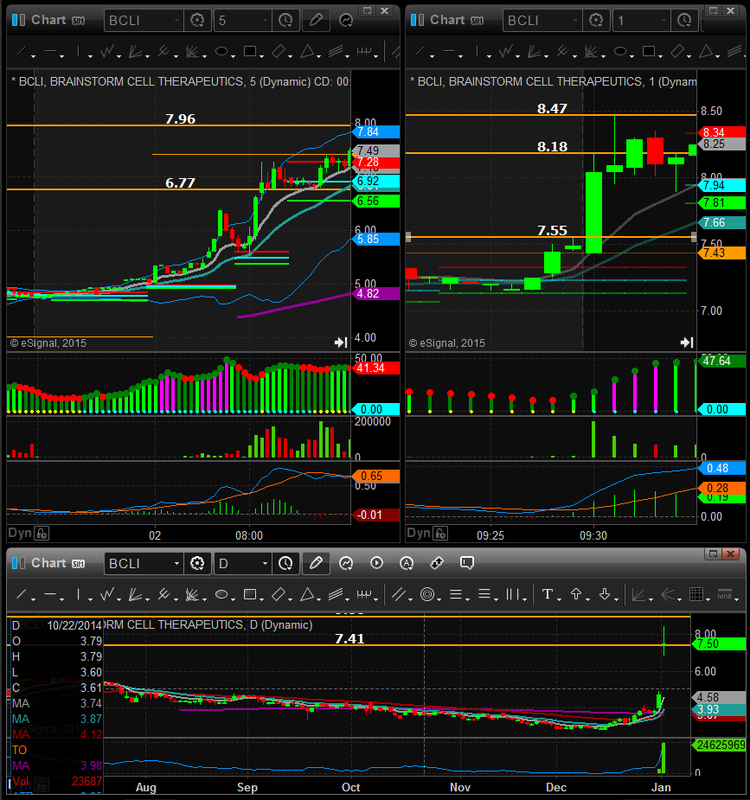 Pre-market high of 7.55, bought at soon as it broke and got filled at 7.60, sold on the spike to 8.48. 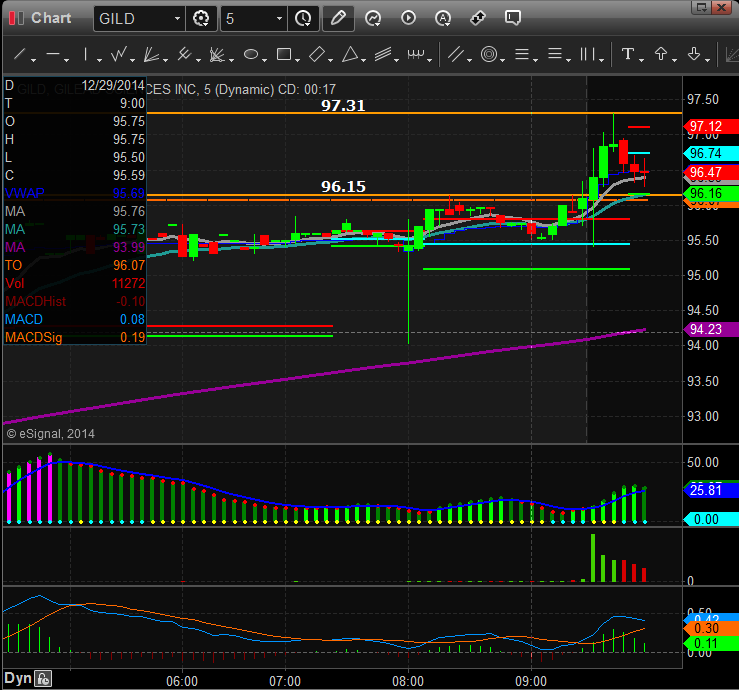 Beautiful opening range breakout. 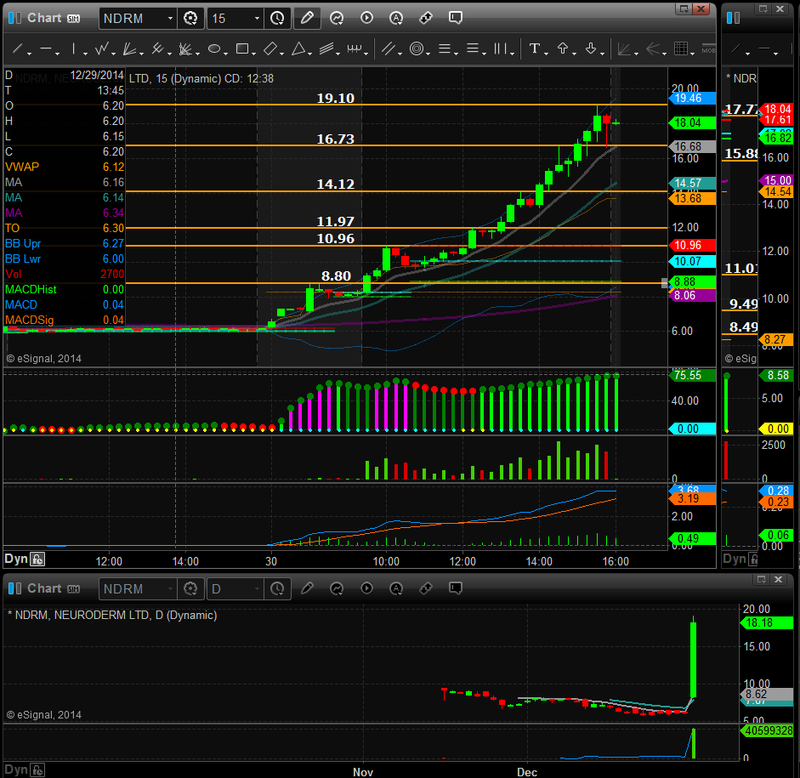 $NDRM got long at 8.48 as soon as the market opened. This surged up to 11.00 in the first 45min of the market being open. I continued trading this as the day went on, applying our Opening Range Breakout, Flat Top Breakout, Bull Flag Breakout, and Top Reversal Strategies. 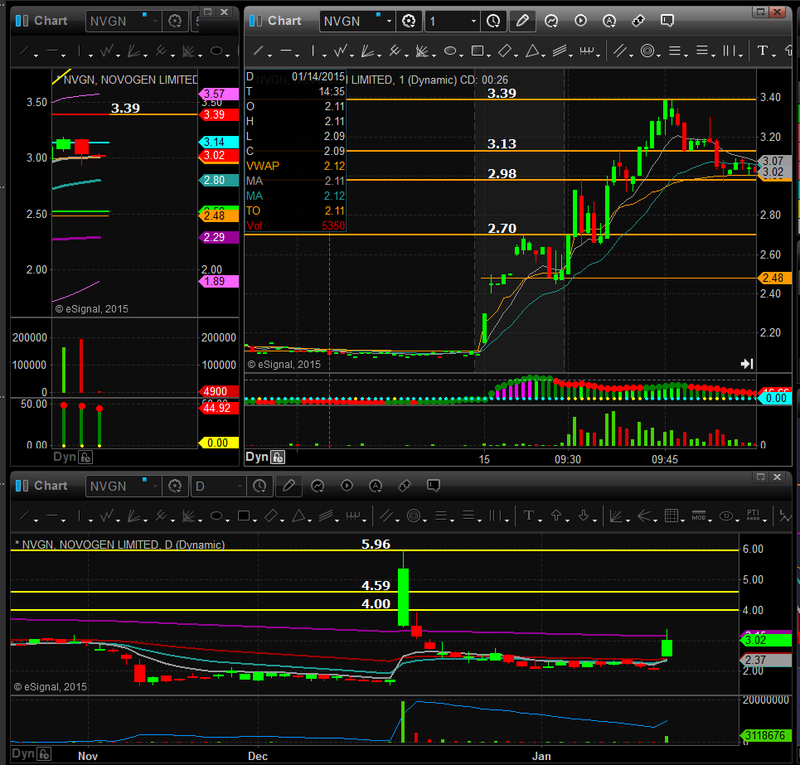 $LIVE premarket high of 4.10, but flagging under 4.00. Long was 4.00 as soon as the bell rings, popped up to 4.15, sold 1/2, pulled back, when it came back up I doubled up and it surged to 4.25.